Body Transformation: Jordan Brown Beat Fat With Brawn! 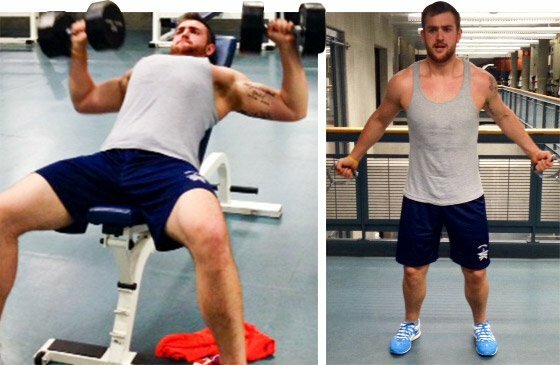 Jordan followed the Bizzy Diet to perfection and cut 75 pounds and 17 percent body fat. See the tip and tricks he used to maintain consistency through adversity! I struggled with weight problems throughout my life but acted like it didn't bother me. People made crude remarks regarding my size and I blew them off. I walked around thinking that I looked good and nothing needed to change. After nearly reaching 300 pounds, I decided to change for the better because I couldn't stand the sight in the mirror. I realized that it wasn't OK to be overweight and it was taking a toll on my body. It was the best decision I have ever made, and today I can say I've never felt better. This isn't the first time I tried to lose weight, but it's the only time I stuck with it. Living with a mindset that it's OK to be overweight is something I can't understand now. The change allowed me to live a more comfortable life. In the gym, I'm able to work harder and longer. It's easier to talk with girls and develop relationships. I make better choices when I go out to eat and am able to help others with fitness goals. My life is much easier now that I'm in better shape. Through my transformation, I built lifelong skills and relationships. I changed my body and mindset toward life. I want to live healthy no matter what. It took everything I had to not quit. I used to think I was active and athletic, but I wasn't. To make such drastic changes in a year, it took willpower to overcome cravings and the desire to quit. Reverting back to the old me would've been easy, but I decided to take the road less traveled and put my nose in the dirt. The days I thought most about quitting were loaded with cardio. It would've been easy to step off the treadmill and walk out of the gym, but I kept reminding myself that it would be worth it. I got inspiration from compliments and others who made progress around me. Nothing feels better than having a random person in the gym come up and say they notice the hard work you put in. It helps to see others in the transformation process and know that it's possible. I started my transformation on the The Bizzy Diet 21-Day Fitness Plan. After that, I started a 4-day on 1-day off workout schedule. I do abdominal workouts every other day and start every workout with stretching and 20-30 minutes on the treadmill or stairmaster. The biggest challenge was to stick with my transformation and avoid quitting. It was hard, but I didn't fall to temptations. I didn't cheat once on the Bizzy Diet or miss a workout. Another challenging aspect was my lack of patience. I expected to see results quickly but kept telling myself to wait for the results, which eventually came. "No matter where your starting point is, it can be done with the right mindset." Now that I'm at a comfortable weight, I plan to bulk up and maintain my healthy lifestyle and never going back to the old me. I plan to live as healthy as possible. Don't quit. It will be worth it in the end. No matter where your starting point is, it can be done with the right mindset. I've been there before, but when you decide that it's for real, the opportunities and outcomes are endless. My transformation wouldn't have been possible without Bodybuilding.com. When I first started, I had no idea what supplements were or how to work out. Thanks MusclePharm and Cory Gregory for teaming with Bodybuilding.com to create the Bizzy Diet. I also want to thank Lifting Luke at Bodybuilding.com for helping me when I had questions about supplements.